Let’s talk about Aviations. Ever had one? The first time I came across the classic drink was at a work happy hour. My cocktail-loving friend ordered one, and it was beautiful—a pale sky blue so light it looked almost white. The second one? Not so much. It was a violet that bordered on radioactive. At the time, I was amazed that the two cocktails could go by the same name, let alone taste remotely alike. Crème de Violette is the ingredient that gives the the cocktail its blueish-purple hue, but it turns out that the liqueur isn’t necessarily required to make an Aviation. In fact, Harry Craddock omitted it when he published a version of the Aviation in the now-famous Savoy Cocktail Book (1930). Leave it out if you like, but I like my Aviations a little floral. And purply. 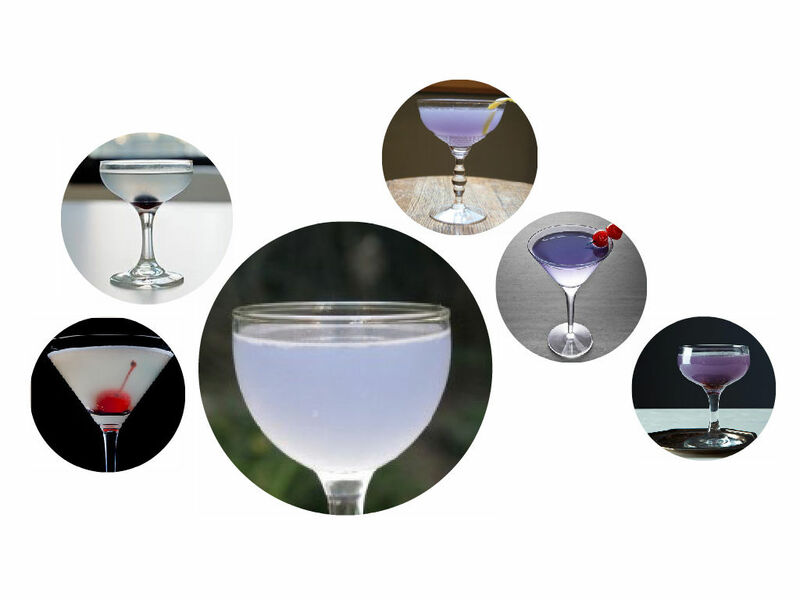 If you order an the drink out at a cocktail bar, there’s no telling whether it’ll be ghost white or Barney purple (hence the wide spectrum of hues above), unless you know the proportions that your bartender is using. After making a few of my own Aviations, it became clear that a little bit of Crème de Violette goes a long way. Sure, the sweet floral liqueur has a prominent flavor, but it’s the super saturated color that can turn a drink from pale blue to dark violet with just an extra eighth of an ounce. I finally settled on a recipe I like, thanks in part to this video found on Gothamist, which instructs you to “wash the glass” with a dash of violet liqueur. That’s in contrast to most recipes, which call for all of the components to be shaken together. Add the Crème de Violette and swirl to coat the glass. In an ice-filled shaker, add the gin, lemon juice, and maraschino liqueur. Shake until chilled, and pour the contents into the glass. Garnish with a maraschino cherry or a lemon twist, whichever you prefer. I omitted the simple syrup that the original recipe calls for—the Luxardo maraschino is plenty sweet. Cheers, and good luck! Because if you end up making this cocktail, it’s probably all you will crave for the next several months.